Primitive dolls, ornies, bowl fillers and other fabric prims usually look hurriedly stitched and thrown together. Odd-colored thread, mismatching eyes and sloppy seams are part of primitive crafting charm. Transforming your prims into a much loved or used item is easy to do. By applying a stain, you can grunge a prim, giving it a dirty look and feel. Mix 1/2 cup of instant coffee granules, one tablespoon of cinnamon, one teaspoon of nutmeg, one teaspoon of ginger and one teaspoon of vanilla with one cup of hot water in a small bowl to create your grunge stain. Paint the grunge stain on your fabric or stuffed prim item using a sponge paint brush. 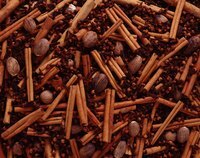 Sprinkle the wet prim item with more of the dried spices and rub them into the fabric. Cover a cookie sheet with aluminum foil. Lay the wet prim on the cookie sheet and place in a preheated oven at 150 degrees. Turn the grunged item every 10 minutes until it is dry. Sand random areas of the grunged prim item to give it a worn-out look. If the prim is not grungy enough, repeat the process until you are satisfied.